A while ago Botanicals had a great offer on their website which I couldn’t ignore – you could get a free hand serum if you bought their anti-ageing hand balm. Botanicals Beautiful Hands serum was on my wishlist for a while at that time and getting it for free with the hand balm was something I didn’t want to miss out on so I went for the offer. I didn’t exactly need the hand balm but I thought it would come handy in winter when my skin needs more moisturising. I have now used up the hand serum but I still have a plenty of the hand balm left. Just to mention that I am not new to Botanicals brand, it’s actually one of my favourite organic skincare brands – I love how natural their products are and the fact that they are also certified organic by the Soil Association. I am currently using their Mandarin & Chamomile toner (review here) and I am about to try a PR sample of their Balancing Mask. Being familiar with the brand I had quite high expectations for their hand serum and hand balm. Let’s see how I got on. After I heard about Beautiful Hands serum on one of the beauty blogs I follow it went straight on my wishlist. After the face, hands are first to be hit by first signs of ageing and it’s really important to look after them as you would look after your face. A serum for the hands which helps to prevent ageing and even tackles the existing issues sounds pretty good, right? The main reason why I bought this anti-ageing hand serum was to improve the pigmentation on my left hand. My right hand seems to be fine, but my left is the one that suffered from 2nd degree burn in the past, leaving me with scar tissue and thinner skin. This is the reason why skin on this hand is more sensitive and it can get brown spots easier but I also believe it’s more susceptible to ageing, so looking after it is pretty important. The Botanicals’ Beautiful Hands serum is a blend of cold-pressed organic oils which work together to help to rejuvenate the skin, improve skin tone and flexibility. The oils that are meant to improve the pigmentation are frankincense and sweet fennel and these also help to reduce micro-wrinkles, and generally tone and tighten the skin. The serum also contains rosehip, carrot and apricot kernel oils, just to mention a few other oils in the blend. These oils contain omegas, vitamin A and vitamin E which all help to nourish, moisturise and rejuvenate the skin. The serum has deep orange colour and a gentle lavender scent which overpowers other less powerful scents. If I try I think I could also smell the fennel. The overall scent is pleasant and not too strong. The product absorbs into the skin pretty quickly, it does not feel greasy afterwards and the skin feels nice and soft after that. I’ve been mainly using it on the back of my hands, hoping to improve my pigmentation (on the right hand it was more as a treat). After a month of using it every evening for overnight rejuvenation I didn’t think it was doing much to my brown spots. I then continued to use it until the bottle was empty and I think at the end I noticed my brown spots were slightly less visible. I don’t think there is a big difference though, the pigmentation appeared only slightly faded. I guess this is something you have to use long-term before you spot any major improvements. Would I buy it again? Hmm, it costs £13.95 for 10ml bottle and I used it up pretty quickly, it didn’t last more than 2 months. You do however have an option to buy a bigger bottle which is £23.95 for 30ml. This works out cheaper of course and definitely worth buying if you plan to use this product long-term. I may buy it again in the future as a treat and when Botanicals are doing some offers again. If there is something that Botanicals excel in is the scent. All their products seem to be beautifully scented and their Lemongrass & Mandarin Hand balm is no exception. I just love the scent of this balm, the lemony scent with a hint of mandarin in the background is a pure joy to my senses. I apply this balm every night before I go to bed and it always feels like a luxurious treatment. This is my first hand balm, so I wasn’t quite sure what to expect. I knew it would be richer than a hand cream, but apart from that I didn’t know what to expect. Looking at the open jar, the product seems to have a grainy texture and a faint yellow colour. It seems to be quite solid but when you apply it onto the skin, it’s a bit of a surprise actually – massaging it into the skin makes the balm melt and all the grainy bits immediately disappear. This is not the type of product which absorbs quickly, therefore it’s more suitable for the night use than the day time use. When you touch the skin after you have applied the balm, you can feel the light greasiness on top, but with time this fades as the balm gets absorbed into the skin. The end result is nourished and soft skin, lightly scented with lemongrass. You only need to use a little bit of balm for both hands therefore this is a product which can last for ages. My hands are not extremely dry and I like to use this balm more for the maintenance than anything else. Sometimes I get more dryness on the tips of my fingers, my finger tips become almost chapped and while Botanicals hand balm does help, it does not work as good as I would like it to work for this problem. For this reason, I would say that if you have chapped hands you should go for something richer and more moisturising. 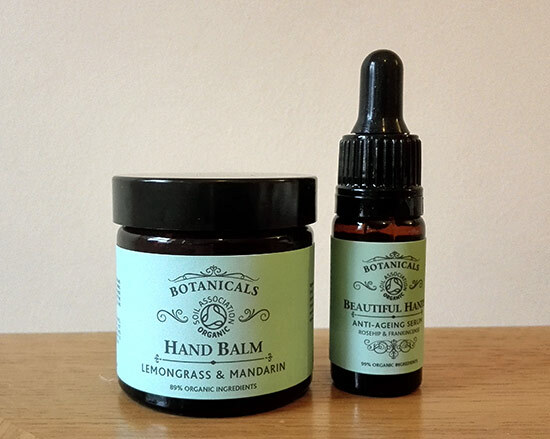 All in all, the Lemongrass & Mandarin hand balm is a lovely product, 100% natural with 89% organic ingredients, it has a gorgeous scent and it works well to keep the skin hydrated and helps to prevent winter dryness. Have you tried any of these Botanicals products before and what did you think? I love the Lemongrass scent as well. When it comes to beautifully scented natural skincare products Botanicals are the best. I am glad you liked the post Sharon.